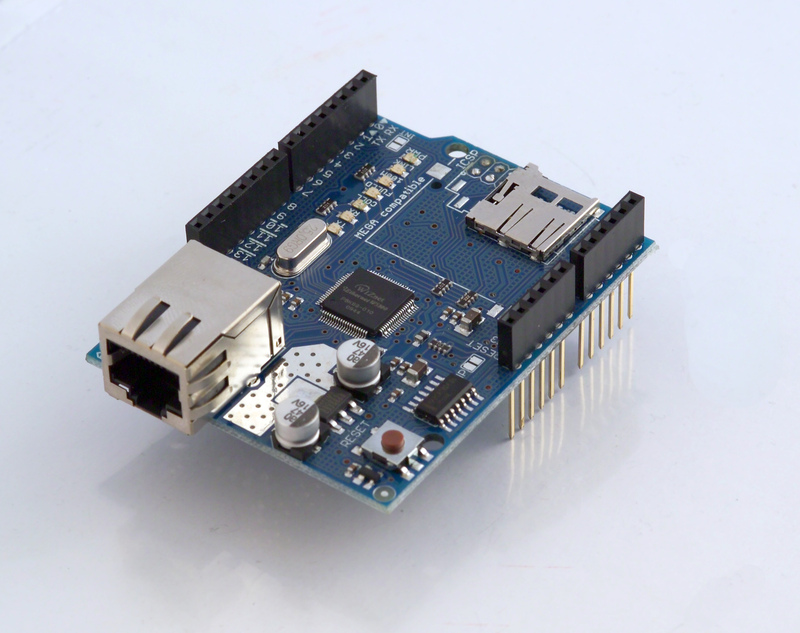 After a couple of years of prototypes, tests and announcements, finally we have produced an ethernet shield for Arduino. This module gives Arduino the ability to open connections to other Internet hosts or behave like a server, for example a simple web server. We like this design because it uses the w5100 chip from WizNet that implements the whole IP stack in itself providing up to 4 sockets simultaneously. I believe this will provide Arduino enthusiasts around the world with a platfrom that is initially simple to use but with room for growth as the knowledge of the user increases. From the Internet of Things to the Internet of Arduinos, happy tinkering. Great! When can I buy one? And how much will it be, ballpark? Interesting how is it different than the one on adafruit’s website? Can some of the networking examples from make things talk work with it? How about PCEEG sensors talking to a arduino server that can talk to a very large sd memory card or flash drive for a atomic data store of EEG data taken from a wider frequency range than the modular eeg? The sd card is on the board that is cool so how would someone talk to it? does the ethernet connector need to use gpio to talk to it otherwise why is it their? I can understand a library may not have been written yet is it broken? Please, pretty please, make it *cheap*! For internet of things we need very many boards. We know that the SD card slot is not accessible yet. I’m wondering if this is just a matter of ‘software’ (should be solved on next releases) or is something ‘hardware’ related, and, in that case, will be better to wait until we get the next version of the Ethernet board? It’s a very economic way of adding ethernet & wifi to an Arduino. Or should we see it as extending a linux-based wireless router with sensors, ADC’s, motors, etc. ?